Hey @Theressa - I just looked over your account again and noticed that you spoke with one of our agents last night. Are you able to log into your Self Serve without any errors now? 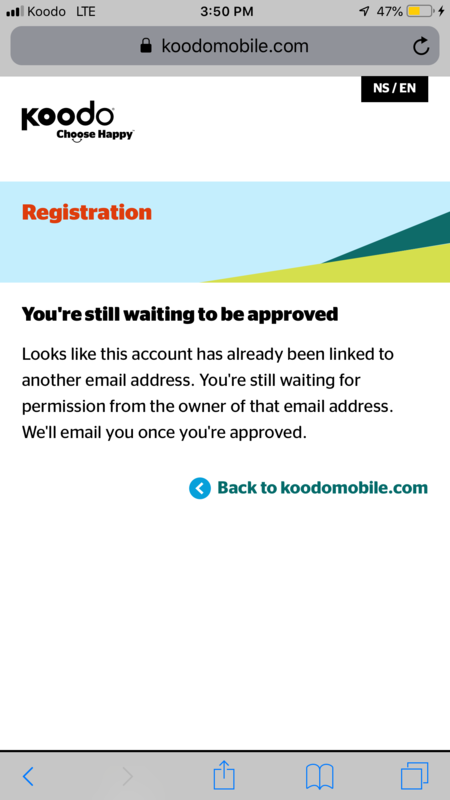 If you logged in to your self serve account yesterday with no issues and now you can't after using the correct log-in info then I would contact Koodo. You can request a callback through the assistant or send a message through Facebook or Twitter. There may be a chance that a rep stops by here and will be able to help you fix your log-in problem. You can schedule a callback for a certain time from the options that it gives you that works for you. Maybe sending them a message on Facebook will be best for you. They will verify your account with you and they should be able to fix it. You could send message to their facebook https://www.facebook.com/Koodo you would not have to talk to an agent over facebook messaging. You mentioned you got the access to your account before? That error normally happened to new customer only. That's strange.. the email you're using here is linked to a number ending in 74, @Theressa. I see that it's set up properly, and that you were able to log in today. Can you confirm that you're using the same email being used here (a hotmail account)? If so, have you tried the 'forgot password' option? It should be working, but if you're still having trouble, I would recommend scheduling a callback at a time that you will be available/won't be at work, using Koodo Assist. You can also send us a private message on Facebook, as mentioned above, but keep in mind that it's not a live chat, and may take a few hours to get a response.